Welcome to Day Twenty-One of Fiction University’s At-Home Workshop: Idea to Novel in 31 Days. For the rest of the month, we’ll focus on plot and the major turning points of a novel. Today, we’re looking at writing a strong opening scene. The opening scene is, of course, the way the novel opens. It usually introduces the protagonist, though sometimes an opening scene starts with the antagonist, or a bit of history instead. It shows the world and gives a taste of why the protagonist is different or special enough to ask someone to read about him. It also sums up the key points readers need to know to understand the character. Why the opening scene is important: It sets the tone and gives readers an idea of what they can expect from the novel. It also provides the all-important hook to grab readers and make them want to read this novel. The primary goal of an opening scene is to make readers want to read the next scene. You’d be surprised how often this is forgotten, because the focus is on establishing the setting, introducing the protagonist, and telling readers all about the cool story waiting for them. These are all important, but on their own they’re not going to do what an opening scene needs to do—grab readers and keep them reading. The opening scene problem doesn’t have to be part of the core conflict. It can be something inherent to the world the protagonist lives in. Maybe he’s being chased by monsters, or dodging a nasty boss, or even arguing with his ex-spouse. Whatever a typical issue is for the protagonist can work in an opening scene. Of course, it’s also fine if the opening problem is part of the core conflict and gets readers into the main plot right away. 1. What is a typical day like for your protagonist? Your protagonist has a life, and that life is going on before the problems of the novel appear. How would you describe a normal day in that life? 2. What problems might occur in that typical day? These are the possible things that could go wrong and send your protagonist toward the core conflict of the novel. Any problem might work, but try to think of things that could connect in some way to that larger core conflict or the protagonist’s character arc. You can also try looking at what a bad day for him is like, as opening-scene problems are often found there. 3. What is the core conflict of your novel? This may seem like a strange question to ask about a beginning, but the beginning is all about sending your protagonist toward this core conflict. If you don’t know where he’s going, it’s harder to know where he starts that journey. It’s good to remind yourself what the end goal of the novel is as you develop your beginning. Look at both the internal and external conflicts as well. 4. What critical setting or world-building details are needed to understand the world? If you’re writing genre or have characters with special powers, it’s good to get those details in right away (unless hiding them is part of the plot). While you don’t want to bog the story down with explanation, there might be vital details about the setting or world you want readers to know in the opening scene. How might you add those elements? Could they be part of the opening scene problem? 5. What is likable or compelling about your protagonist? What are the vital details readers have to know to connect with this character? What will make them like him? Feel for him? Be intrigued by him if he isn’t likable? You don’t want to tell the whole history in the opening, but a few things that illustrate who this character is as it relates to the opening scene can help draw readers in. If the character isn’t likable, then show what makes him compelling enough to read about. 6. What is the first image you want readers to see? An opening scene sets the tone and mood of a novel. How do you want readers to feel as they start your novel? What expectations do you want to set? What event or situation might get those images, emotions, or ideas across? 7. Is the opening scene the inciting event or a problem that leads to the inciting event? This can determine how connected to the core conflict the scene problem is. If the inciting event is still to come, this scene might focus on another aspect of the protagonist’s life or the inherent conflict of the world. 8. How does the opening scene end? The scene will end with something that transitions into the next scene or chapter. An “oh no” or “oh cool” moment that will keep the character moving ahead in the plot. When designing an opening scene, think about how it will hand off the plot to the next scene. EXERCISE: Describe how your novel opens. Be as detailed or as vague as you’d like. Try to end the scene with something happening that will create a goal that leads to the next scene. 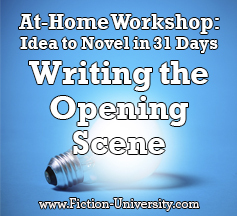 It’s not uncommon for this scene to change as you learn more about your novel and plot. As ideas hit you, come back and flesh out this summary. If you’re not sure how much to write, aim for one or two paragraphs that describe how the novel opens, what the protagonist is doing, why he’s doing it, what goes wrong, what’s at stake, and what the protagonist decides to do next. Writing more is also acceptable if you want to continue with how the plot would unfold to the next major turning point. Feel free to add in any notes about what the scene is trying to do if you know conceptually what you want, but prefer to figure out the details during the writing process. Tomorrow, we’ll look at the inciting event.